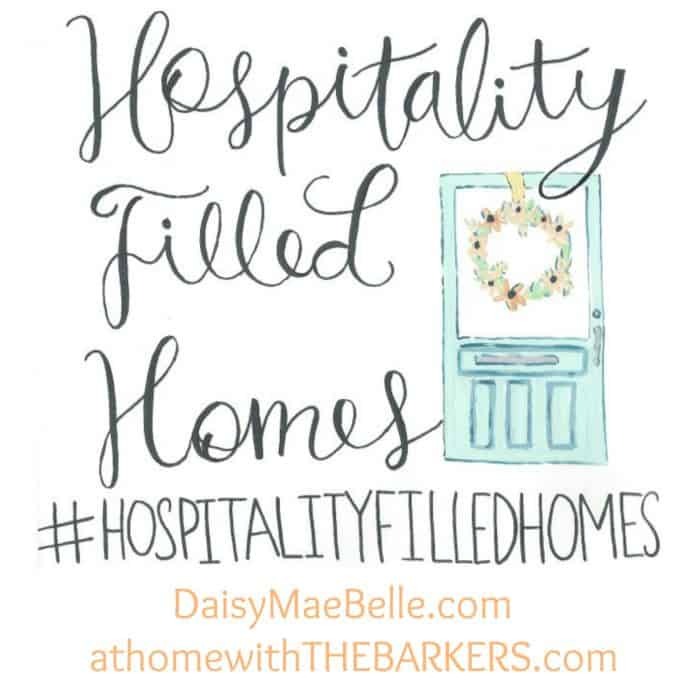 I loved seeing so many of you share your fall wreaths on Instagram for the #hospitalityfilledhomes series. Whether you bought a new wreath, refreshed on old one or completed a DIY wreath, they were all great. 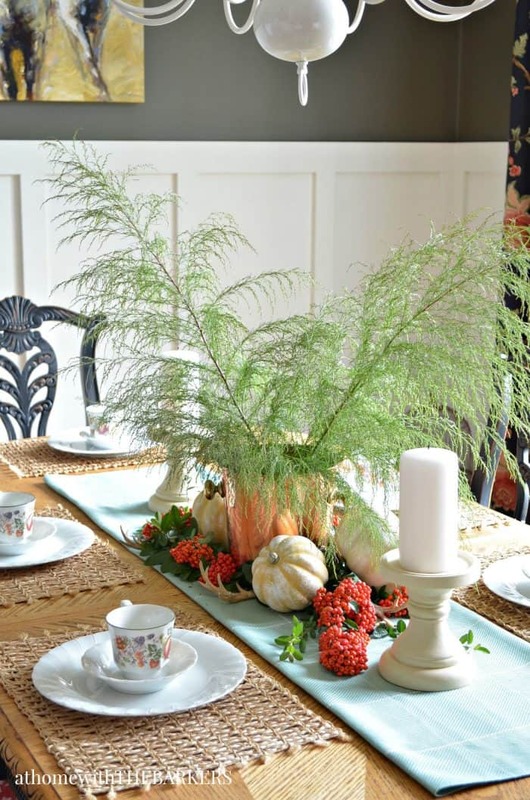 You can see my Natural Fall Wreath HERE if you missed that post on Monday. 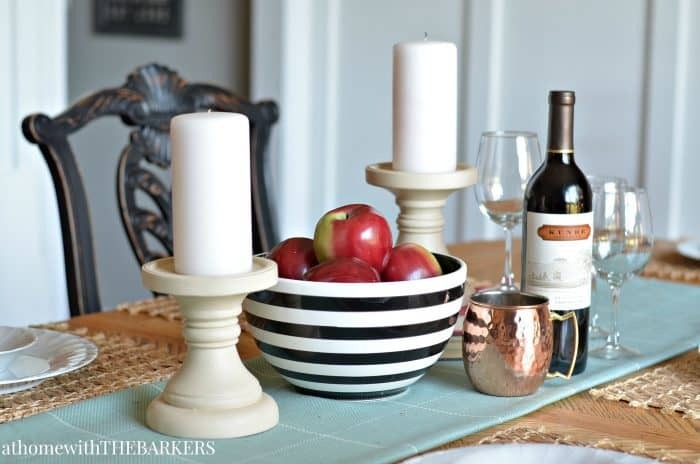 Now we are ready to see your fall table centerpiece. 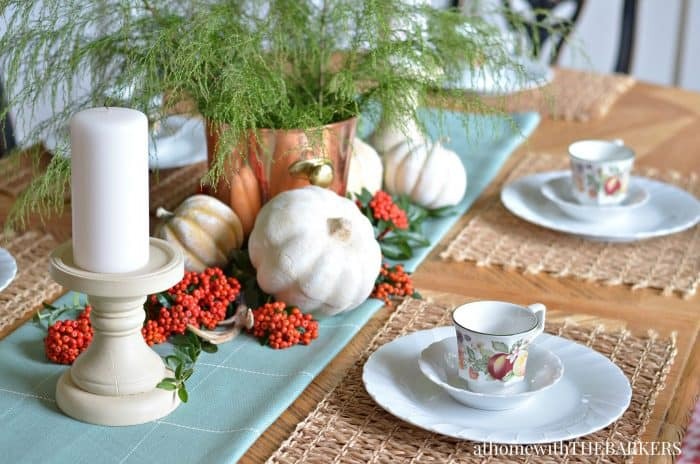 I’m showing you my dining table centerpiece but we really would love to see any fall centerpiece in your home and share over on Instagram. 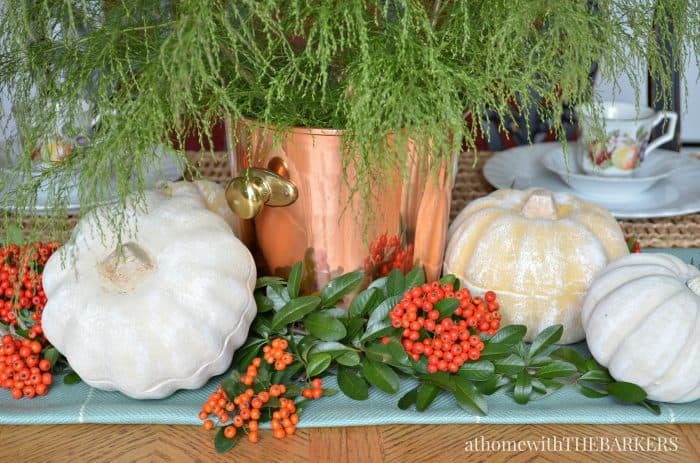 Melissa (Daisy Mae Belle) and I have another fabulous group of bloggers today sharing their fall centerpiece that I am sure will inspire you. 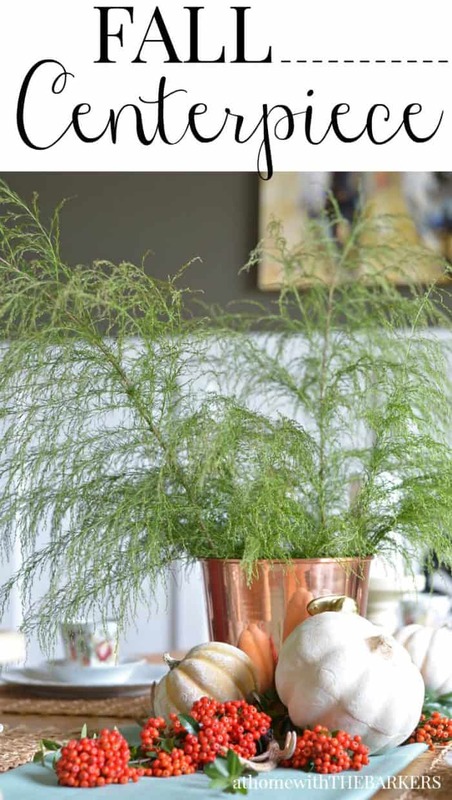 Like I told you in my 3 Decorating Secrets for Fall post I love to reuse things I have and free things I find. That’s how this years fall centerpiece was born. 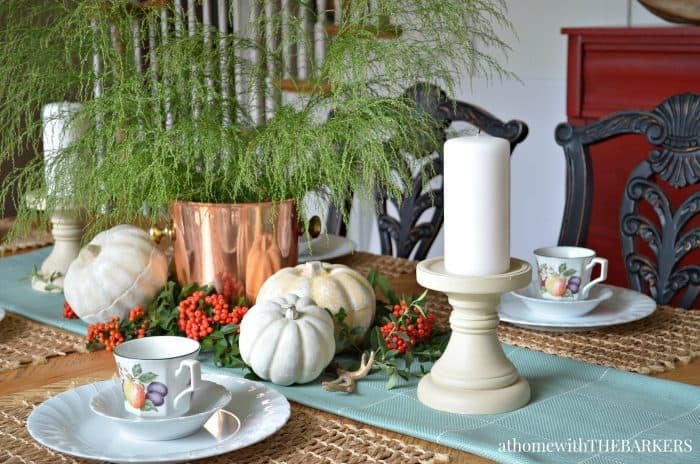 I pulled out my painted pumpkins from last year, candles from my mantel, a copper ice bucket from a thrift store, a few little antlers that were christmas ornaments, fabric runner, and some fresh greenery that my sister and I cut from the side of the road. Then I layered it. Started with the large items and went from there. Decorating Tip: It’s super simple if you go from big to small and tall to small. The white plates and placemats are all from yard sales. The fruit coffee cups are our wedding dishes. The colors looks so pretty, right? THERE’S ONLY ONE THING…the headache I got from the greenery. Seriously, from the moment it was cut my head started pounding. After I took all of these photos I had to take it outside. SAD! I will have to replace it with fake greenery to keep our allergies in check. Since I didn’t want to leave my table without a centerpiece I grabbed some allergy free items and quickly created a new one. Still using only what I had around my house. I love this! I still have not set up my table but I will soon enough 🙂 Thanks for posting! So so pretty Sonya… so sad about your allergies! LOVE the light aqua runner that works so well with all your fall colors! 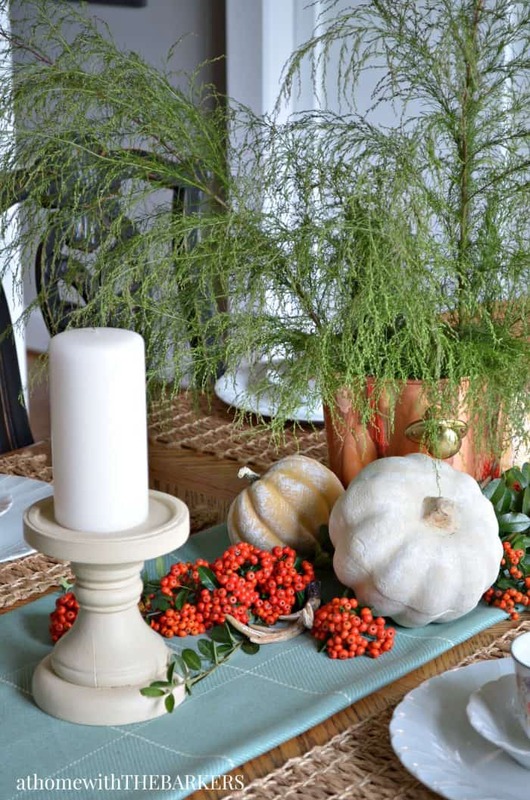 Layering is the secret for a great tablescape and centerpiece… and you do it so beautifully! 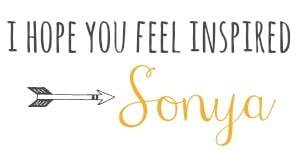 This is beautiful Sonya! And I’m in Love with the copper touches! !